A few weeks ago I took a trip with my dad to visit some family in Portland. I was really excited when I initially found out about the trip because I'd never been there before. Immediately I turned to Pinterest (what else is new) and began searching things I wanted to do, places I wanted to see, and more importantly - food I wanted to eat ;) What was nice about this trip is we had Portland natives with us (my aunt, uncle, and cousin) that knew where exactly to take us - touristy and non touristy locations. Check out my list of 5 things to do with your 5 days in Portland! 1. Portland Saturday Market. Contrary to the name, this market is open on Saturdays AND Sundays from March to Christmas Eve. We went on a Sunday and the weather was beautiful and sunny (quite unlike Portland weather) that made the day that much more enjoyable. I was surprise how big the market was - there was tons of food and drink stands, different stage areas for live music, craft tents/areas set up selling anything you can imagine, and tons more. We walked around, got some food and coffee and then headed to the days main attraction: Voodoo Doughnuts. We waited in line for over an hour! Ok... when I say we... I mean some members of my family, while my Dad and cousins walked around a bit. Overall thoughts on Voodoo Doughnuts? They were good and one of the things I wanted to do this trip - but overall worth the wait? Eh.. not sure. 2. 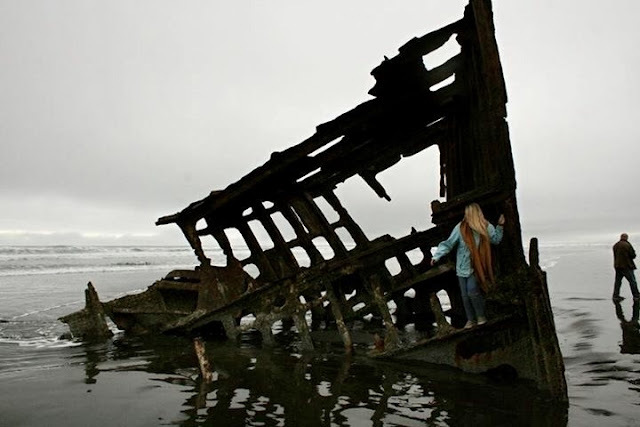 Haystack Rock/Peter Iredale Shipwreck. Both located on the coast of Oregon (Haytack rock is on Cannon Beach off of Ecola State Park and Peter Iredale Shipwreck on the beach of Fort Stevens State Park) and are beautiful sites to see. Being from the Midwest, the ocean fascinates me. These two landmarks are definitely something to check out. Fun Facts: The shipwreck is from 1906!! Also, Haystack rock is a 235 foot sea stack. When the tide is low enough you can actually walk up to it! Additionally, we stopped to grab a bite to eat after Haystack Rock. I loooove seafood so I figured the best place to get seafood was right on the coast. Ecola Seafoods (the name is a little off putting) had the most amazing clam chowder I have ever had. Afterwards, I grabbed a strawberry, nutella, whipped cream crepe at Crepe Neptune that was AMAZING. 4. Timberline Lodge - Mt. Hood. After a day exploring the coast, we took a drive up to the mountains. Can we just take a second to admire how adventurous and nature-y I was this trip??? We didn't take too many pictures here as I spent most of my time in the gift shop (are you surprised?) but I did need a picture outside in front of The Shining's Overlook Hotel. 5. Multnomah Falls - West Columbia River Gorge. Driving up to the mountains I was fascinated by all the cute little waterfalls we were passing. I was taking pictures of any that I would see not knowing what was in store for me later. Driving down from Mt. Hood we approached Multnomah Falls and I think my jaw dropped. At 620 feet, Multnomah falls is without a doubt the 'grandaddy' of them all. Attracting approximately 2.5 MILLION visitors per year, this waterfall is Oregon's #1 visited natural attraction. Starting at the bottom, you can take a short hike up a bridge (constructed in 1914 - YIKES) that gives you an even better view of the waterfalls. Caution: would advise bringing an umbrella because you will get wet. Crossed Portland off my list and I'm ready for the next adventure.